This 1985 book consists of essays reviewing progress or reporting original results in areas of the applications of gravity theory to which Professor Bonnor had contributed. 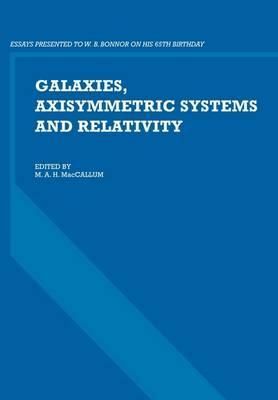 In particular, the influence of his work in two important fields of interest to astonomers, physicists and mathematicians, galaxy formation and the study of axisymmetric solutions in general relativity, is well recognised. The essays on galaxies and astrophysical cosmology are related to Professor Bonnor's work on the treatment of perturbations of uniform cosmological models, while the essays on axisymmetric solutions reflect the concerns of his long series of papers on the subject, which began with generating techniques and went on to deal with interpretation of the solutions obtained. In addition there is a number of essays on other topics in gravity theory, including numerical work, mathematical cosmology and gravitational waves.